“The spirit and the body shall be reunited again in its perfect form; both limb and joint shall be restored to its proper frame, even as we now are at this time” (Alma 11:43). Instructions: With the help of an adult, trace the puppet pattern (the dark outline), and cut it out. Place the pattern on a folded piece of colored fabric, trace, and cut it out. Repeat these steps on plain white fabric. Draw and color the boy (or change the figure to a girl) in pants on one piece of colored fabric, and draw the boy in a robe on one piece of white fabric. Place the drawing of the boy in pants facedown on the other piece of colored fabric, and sew or glue the pieces together using a half-inch (1.5-cm) seam, leaving the bottom open. Repeat sewing procedures for the white fabric. Place the puppets in your Sunday Box, or use them in family home evening to teach about our journey through life. The white puppet represents the spirit, which lived in the pre-earth life with Heavenly Father. 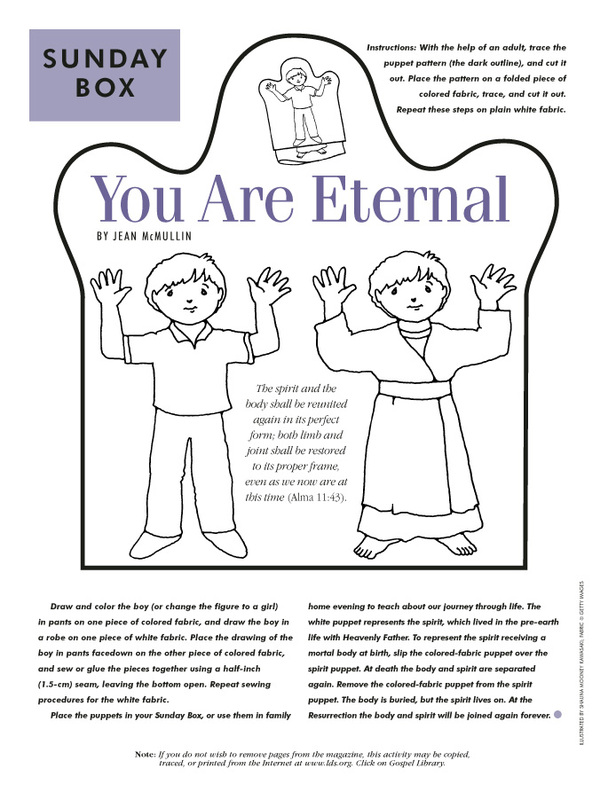 To represent the spirit receiving a mortal body at birth, slip the colored-fabric puppet over the spirit puppet. At death the body and spirit are separated again. Remove the colored-fabric puppet from the spirit puppet. The body is buried, but the spirit lives on. At the Resurrection the body and spirit will be joined again forever.